Great harvests of Maha season paddy are already being collected in the north and east, and with a glut expected, the government is preparing to sell current stocks of rice abroad and make a donation to the World Food Organisation. Authorities are desperately trying to clear government storehouses of paddy bought from the last season to make way for new stocks. In order to give all farmers a chance to sell their paddy at the higher price offered by the government, the Paddy Marketing Board (PMB) has set up a database of names of the farmers along with their National Identity Card numbers. Farmers who come to sell their produce are checked against the list and their NIC numbers tallied to prevent duplication and fraud. This year, the PMB is planning to buy 160,000 metric tons from farmers around the island, 2,000kg from each farmer. That is expected to take up only 6 per cent of the crop, and the farmers will have to seek private markets to sell the bulk of their paddy. Farmers are apprehensive that the glut will enable private mill owners to bring down the price drastically. They are lobbying for a fixed price for paddy but PMB Chairman M.B. Dissanayake rejects this plea, saying the government’s prices would stabilise the price of paddy in the private market. Mr. Dissanayake said northern farmers have already harvested their paddy and the PMB will start making crop purchases from the Ampara and Kilinochchi areas. The next buying centres will be set up at Batticoloa and Trincomalee. The board is to buy nadu paddy at Rs. 38 per kilo, samba at Rs. 40 per kilo and keeri samba at Rs. 50 a kilo. Mr. Dissanayake said action is being taken to clear the buffer stock of 200,000 metric tons of rice bought during the last harvest and stored in the go-downs of the Agrarian Development Centres. In a frantic effort to clear the storage facilities, the government is disposing of the buffer stock at giveaway prices. Portions of the 3,500 metric tonnes of paddy stored at the disused Mattala Airport were sold to the Biscuit companies, breweries and bakery owners at asking prices. Mr. Dissanayake said Mattala Airport had been cleared and 88,000 tons of the stored paddy in the storage facilities of the PMB disposed of by open tender. About 11,000kg of this paddy will be milled and distributed to Samurdhi recipients at Rs. 65 a kilo and this money will be deducted from the recipients’ monthly allowance. Some 50,000kg will be milled and sold through Lak Sathosa outlets at a nominal rate of Rs. 65 a kilo. In addition, it is learnt that the government is having talks with the World Food Programme to donate 30,000 metric tons of rice in fulfilment of a prior commitment. Negotiations are underway to export rice to the South African region. Mr. Dissanayake said that negotiations are underway with Nigeria, Kenya and Ghana. Samankaduwa Bedun, the association representing farmers in Polonnaruwa, fear the consequences of the expected glut, saying private mill owners always cut prices very low, leading, it claimed, to losses for farmers. The association’s President, Ranjith Ratnayake, said farmers spend around Rs. 34,000 to cultivate one acre of paddy and explained the cost of fertilisers and pesticides were high. Farmers also had to pay for labour during harvest time, he said. He said that, moreover the PMB sometimes rejected paddy that had a high moisture content so that some farmers had to sell their whole crop to private buyers. He said that although farmers dried their paddy to the best of their knowledge they had no way of measuring exact moisture content. The price of paddy is rated according to its moisture content. The accepted moisture level for the PMB is 14 per cent and farmers who bring in paddy that has a higher moisture content areturned away. 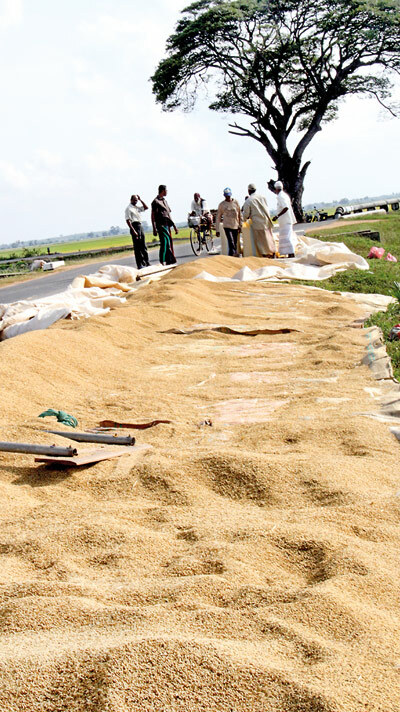 “We have to sell our rice for Rs.35 a kilo at least to have a profit margin of Rs.10,000 amonth,” Mr. Ratnayake said. He also pointed out that the PMB’s practice of purchasing paddy during the middle of the harvesting season deprived farmers who harvested their fields early or late in the season of sales. “They come in the middle of the season, buy from farmers and go, and only those who are lucky get to sell their crop,” Mr. Ratnayake said.